Chit Chat and Small Talk: Goin' Buggy! We're goin' buggy here at Small Talk this month! This is one of my favorite themes. There is so much to do! My office is transformed into a garden, and there are bugs hiding all around. I bought The Fairy Garden Hideaway from Hearthsong a few years ago and hung it from a hook on my ceiling. I spread the sheer green netting from corner to corner, making my office feel like we are hiding in and under a garden...like bugs! The kids all love it and think it's a magical place to be. 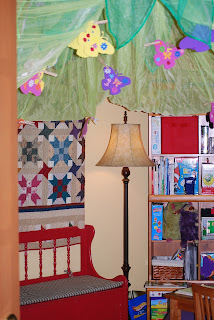 One of their favorite things to do is decorate foam butterflies to hang from the canopy. You can find foam butterflies, flowers and bugs at your local craft store. 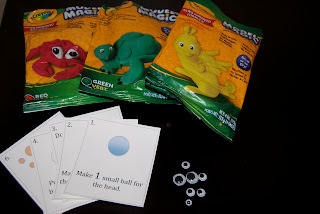 I like to use the smaller pieces to cover up target word pictures to work on articulation. The child removes a flower sticker from the page and practices the word hiding under it. 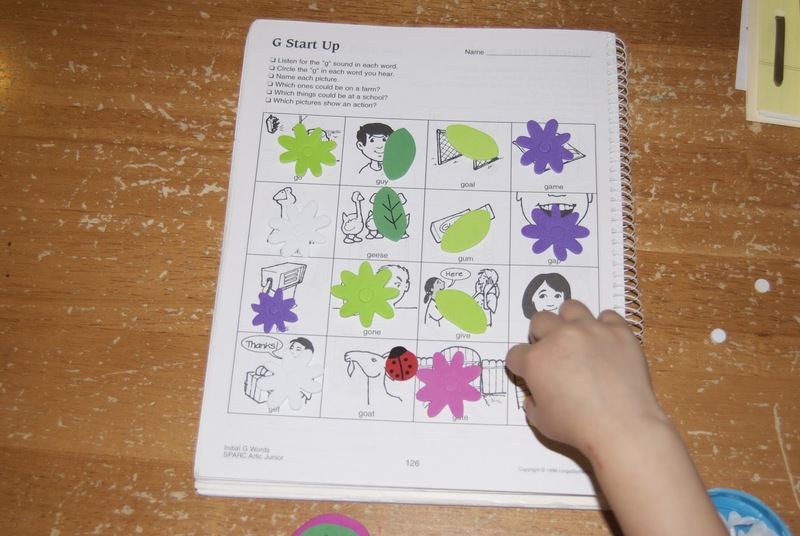 You can do this activity to work on language goals, too. When the butterfly is complete, I let the child show me where he or she would like their butterfly displayed. We talk about the colors of the butterflies on the canopy, and use location words, such as above, below and next to. The children return each week delighted to find new butterflies hanging on the canopy. 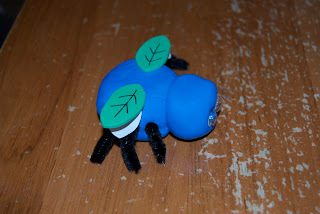 Another fun and easy project to do is to make a bug with Crayola Model Magic modeling material. 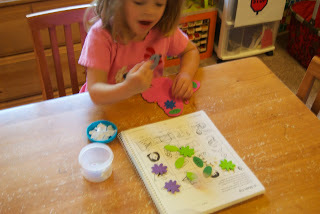 Gather up some googly eyes, pipe cleaners and foam leaf stickers and you're ready to go. Model Magic is a great material if you've never tried it. It is soft and easy to work with, and yet it is not sticky or messy at all. 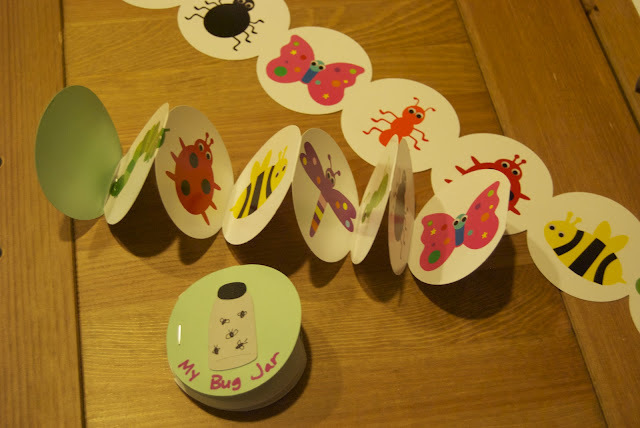 I made a set of 6 sequence cards for the kids to follow to create their own bugs. Several of my kids are working on comparatives, so several of the steps include concepts such as short vs. long, flat vs. round, and large vs. small. Here is what they look like. Here's an example of a bug made by a student, using foam leaf stickers for the wings. This activity lends itself well to creating many language opportunities. I've learned a lot about bugs this week, too. I was taught by a second grader that real insects have THREE body parts, not just TWO, like my activity suggests. Sigh. They always keep us humble, don't they? 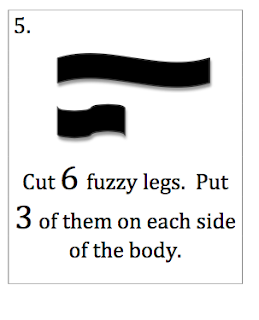 If you'd like a copy of my sequence cards to build your own bugs, you can grab them here. Don't panic if you find them out of sequence in the document...They are all there! I have used this little book to work on a whole host of different goals. We've worked on vocabulary (ex. names of insects, body parts), 2- word phrases (black bug, pink bug, yellow bug) and descriptors. I've used it with my early elementary kids who are using the Expending Expression Tool (EET) with great success, focusing so far on the group name (ex. bugs or insects) and then on "Do" (ex. "What does a ladybug do?). 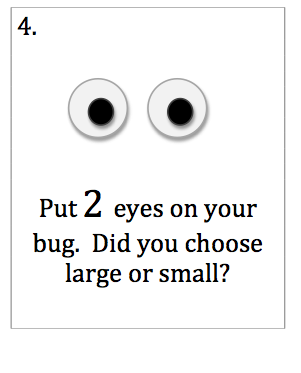 Next week we'll be moving on to size, shape and color to add to our bug descriptions. If you're not familiar with the EET, you should learn about it. 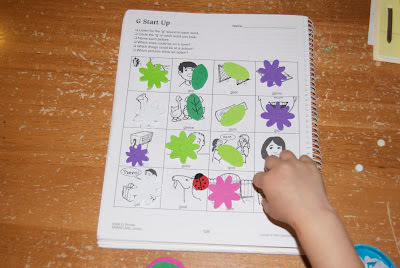 It is a fantastic method for improving language skills developed by an SLP. Check it out here. There. That should keep you busy for awhile! Tapikeo HD App 80% off Today Only!